Mary O. Culpepper, Wife, F, Sep 1877, 22, Md 1 yr, ch 0/0, GA/GA/GA. Muscogee County Court of the Ordinary (Books V-Z transcribed by Warren Culpepper), compiler, Muscogee Co., GA Marriages, 1920-192, Salt Lake City, UT: Genealogical Society of Utah, 1965 Repository: LDS Family History Library - Salt Lake City, Call # Films 401,860 - 401,864. James T. Culpepper and Miss Mary C. Hines on 4 Mar 1898 in Muscogee Co., GA, White Book 1-78. Bethlehem Baptist Church Cemetery, Hamilton (actually Pine Mountain Valley), Harris Co., GA.
+ Mary O. Hines Culpepper, 8 Sep 1877 - 28 Feb 1907 (Wife of J. T. Culpepper). + Ella Culpepper, 1867 – 1938. Mary E. Culpepper, Cousin, Wh, F, 63, wd, md@16, AL/AL/AL. Mary Ela Culpepper died 1 Feb 1935 in Autauga Co., Alabama. Mary E. Culpeper died Feb 1938 in Chilton Co., Alabama. E-mail written 2000 to Lew Griffin from Martin Stewart Culpepper, GEDCOM. Luthur F. Culpepper died 1 Aug 1925 in Autauga Co., Alabama. E-mail written Jul 2004 to Warren Culpepper from Kevin Lawrence Brown, e-mail address. Edward C. Culpepper died 1 Sep 1929 in Autauga Co., Alabama. Charles Augustus Holladay was m. Oct 8, 1863 in Chambers Co., Al.. He was the son of John M. Holladay, Jr. & Maria Rebecca Magnan. Maria was born in 1815 in Jones Co., Ga. to Charles Louis Magnan and Elizabeth Mallam Halsted, daughter of Jonathan Halsted. E-mail written August 2001 to Lew Griffin from Marsha, e-mail address. B. Culpepper, Roomer, M, Wh, 27, sng, AL/GA/AL, Clerk/Steam Railroad. Obituary* 16 Apr 1951� Funeral for Henry H. CULPEPPER, 54, of 1117 Thirteenth street, was to be held at 4 p.m. today, from Britton and Dobbs Chapel with the Rev. T. O. LAMBERT, associate pastor of St. Luke Methodist church, conducting the service. Funeral [sic - 'burial'] was to be in Riverdale Cemetery. Mr. CULPEPPER died early Sunday at Phenix Memorial hospital following a two-week illness. Mr. CULPEPPER, a fender and body worker, was born in Shawmut [Chambers County], Ala., Feb. 13, 1897 [sic - grave monument shows 13 FEB 1898], a son of the late Mr. and Mrs. Henry CULPEPPER. He had lived in Columbus for 18 years, having moved here from Jacksonville, Fla. Surviving are his widow Mrs. Sally CULPEPPER, his stepmother, Mrs. Emma CULPEPPER, Phenix City; a sister, Mrs. Mabel SHIRLING of North Carolina, and a niece. Henry Culpepper, Lodger, M, W, 23, S, AL/AL/AL, Machinist at shipyard. Alabama Death Index: Henry H. CULPEPPER, male, died 15 APR 1951, aged 53 years, in Phenix City, Russell County, Alabama, son of Henry CULPEPPER, Volume 18, Roll 5, certificate #8897, FHL film number 1908859. James Culpepper, Boarder, M, 21, Sng, AL/AL/AL, Machinist/garage. 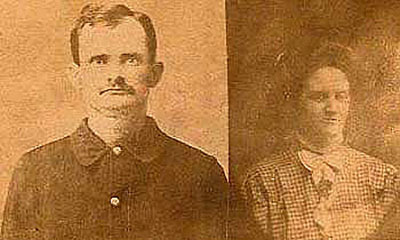 Eli M. Culpepper and Mary E. Darrington on 28 Oct 1869 in Meriwether Co., GA.
From Rev. 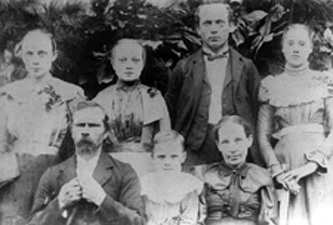 Dr. Thomas W. Binford, III: "I have the picture of the Robert Daniel Culpepper family. Written in the border, I think by my grandmother (Dera Mae Chapman Binford, wife of Thomas W. Binford), is Lizzie, Robert, Ada, J.D., Frank, Milbra, Edna-a friend (Edna has a line through it and up the right side is the name Bessie. )5,6"